James Enge drops by Suvudu to share five facts about his forthcoming novel, The Wolf Age . See "Take Five with James Enge" for what powers a magical zeppelin and why the Grateful Dead are cool. 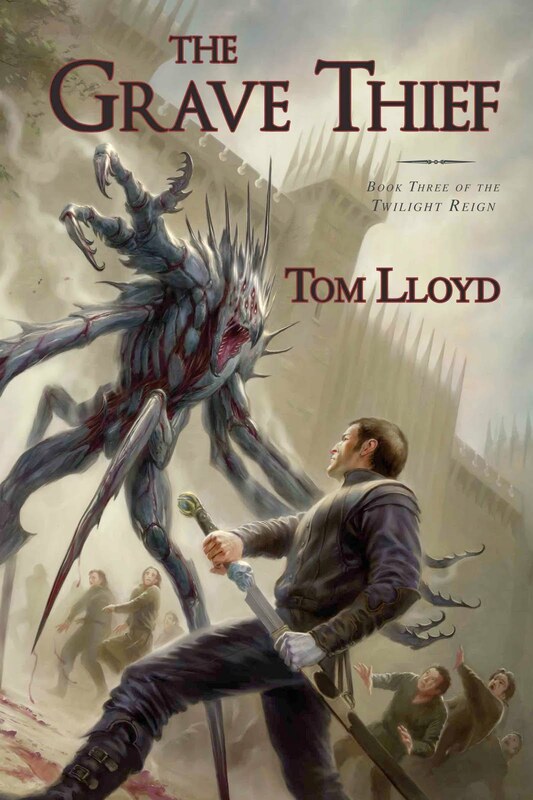 Meanwhile, Sam Sykes, author of Tome of the Undergates , answers "8 Shoddy Questions" on SFFNews today, including #8, "Who would win in a fight between a Koala Bear and a Wombat?" Sam was also recently featured on John Scalzi's The Big Idea, in which he explained that "crotch stompin'" was just the icing on the cake in his examination of what it truly means to be an adventurer. And Twelve author Jasper Kent has an excellent interview up at Pat's Fantasy Hotlist. Welcome to seventeenth century Paris, where intrigue, duels and spies are rife and Cardinal Richelieu’s agents may be prevailed upon to risk life and limb in the name of France at a moment’s notice. And with war on the horizon, the defense of the nation has never been more pressing. Danger is rising from the south--an insidious plot which could end with a huge dragon- shaped shadow falling over France. A shadow cast by dragons quite unlike the pet dragonets which roam the cities like stray cats, or the tame wyverns men ride like horses, high over the Parisian rooftops. These dragons and their descendants are ancient, terrible and powerful... and their plans contain little room for the lives or freedom of puny humans. Cardinal Richelieu has nowhere else to turn; Captain La Fargue and his elite group of agents, the Cardinal’s Blades, must turn the tide. 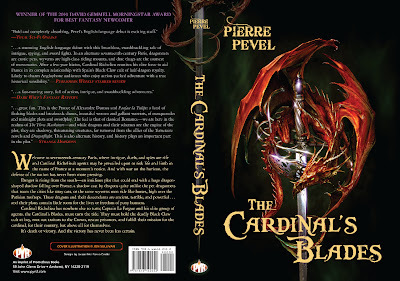 They must hold the deadly Black Claw cult at bay, root out traitors to the crown, rescue prisoners, and fulfill their mission for the Cardinal, for their country, but above all for themselves. I don't know how things are in the USA, but in the UK the seeds planted in the mind of many a small child on February 26th 1977 are now bearing fruit in writers of every sort of alternative fiction. That was the day when the first issue (prog, as it was described) of 2000 AD first hit the streets. I was eight years old. Now I'm in my forties and letting the dark things that lurk somewhere in the recesses of my memory seep out into my work. There's nothing as straightforward as the wonderful cameo by Max Normal in Russell T. Davies' Doctor Who episode Gridlock, but there was one 2000 AD story that has to be acknowledged as an inspiration for my first novel Twelve. The connection may be surprising, since 2000 AD was a science fiction comic, and I don't (currently) write science fiction. But this particular comic strip wasn't SF – it was pure horror. Fiends of the Eastern Front, by Gerry Finley-Day and Carlos Ezquerra, débuted in Prog 158. By then I was twelve. 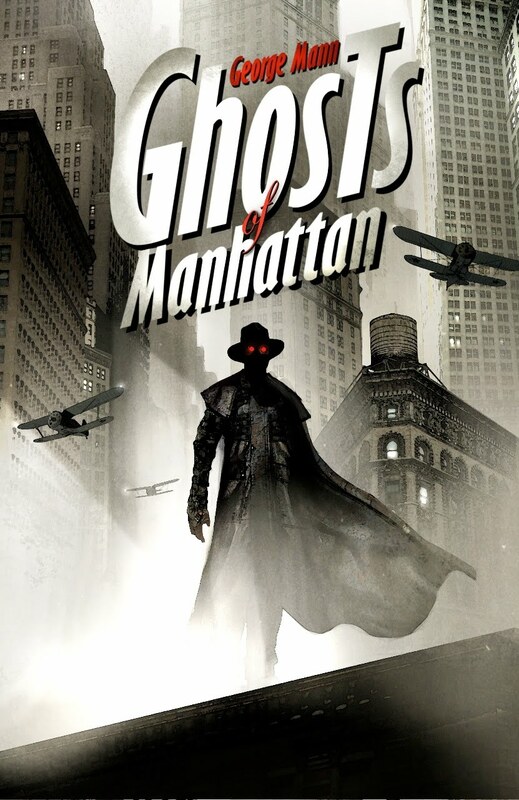 I'd never read it since then, but when the idea for a vampire story set during Napoleon's invasion of Russia came to me I immediately remembered what a powerful combination vampires and war make. Fiends was set on the eastern front in World War Two, with a mysterious squad of Romanian soldiers fighting alongside the Germans. It's the obvious location for such a story – the cold and the long nights providing the perfect environment for vampires to hunt. I quite deliberately didn't go back to look at the comic strip when I was writing Twelve, and it was in fact only last week – now that I'm three books into the quintet – that I got round to it. It's a reflection of modern life (and my indolence) that it was easier to order a bound single volume online than venture into the loft and pick out all the relevant editions from my hoarded comic collection. As it happens, and I'd forgotten, the vampires in Fiends conform to just about every bit of folklore that there is: they don't like garlic or crosses; they can transform into bats and wolves; they can't cross fresh water; they can be killed by silver bullets. None of those characteristics applies to the voordalaki of my novels. One notable difference is that my vampires can be killed by fire, where those in Fiends cannot. Again, that was one of the few things I specifically remembered, and remembered almost exactly Captain Constanta's words when he revealed himself to have survived being incinerated by a flamethrower: 'Cringu told you I can grow from the smallest speck – even from ashes, you fool!' I made a definite decision that that was too unphysical for the world I was creating. So I was well aware of the general connection between Twelve and Fiends of the Eastern Front – vampires fighting in a human war – and I knew a few specific characteristics that I'd chosen to use or ignore. However, there were two connections between the stories which I noticed on rereading Fiends that I had completely forgotten. Whether they come down to coincidence or subconscious recollection is hard to say. The first is in the specificity of numbers. 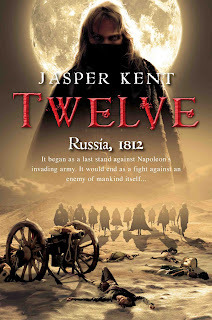 As the title suggests, Twelve is about twelve vampires, and much of the story involve the hero, Aleksei Ivanovich Danilov, picking them off one by one. In the opening of Fiends its hero, Hans Schmitt, is found dead and entombed and on the walls of the cellar he has drawn the silhouettes of ten vampires. He gets through them rather quicker than Aleksei, managing to kill seven of them in one assault. For me, the number came from the fact that I wanted to name my creatures after the apostles – so I suppose we should blame my childhood reading of the Bible, rather than of 2000AD, for that. But the most surprising thing was the discovery that, like Twelve, Fiends was written in the first person. I'm often asked why I chose to write in the first person and I can't say anything other than it simply seemed right. The decision has a major impact on plotting, and in subsequent books I've not found it possible to put together an entire story from one viewpoint. You might think it difficult though for a comic strip – a medium in which the fourth wall is so evident – to be written in the first person. Fiends, however, is told mostly through the diary of Hans Schmidt, discovered with his body in the cellar in Berlin in the present day (as 1980 was described at the time). Thus every caption is, unlike most strips, part of a first person narrative. Again it could be coincidence, but I suspect that format may have influenced me. So what next? Will one of my novels feature a character loosely based on Walter the Wobot, Judge Dredd's irritating sidekick? I doubt it, but it can't be denied that 2000 AD has been an inspiration to me as a writer. And I bet I'm not the only one. 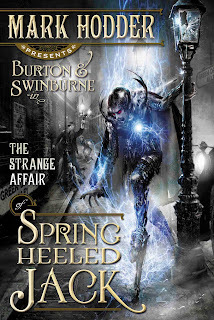 Spring Heeled Jack: An Extraordinary Debut! Can't ask for better praise than this! Congratulations to Jon Sprunk, whose debut novel Shadow's Son has just sold to Russian publisher AST. This brings Jon's total up to eight countries, the others being, besides the US of course, France (Bragelonne), U.K. (Gollancz), Germany (Heyne), Czech Republic (Fantom Print), Spain (Alianza) and Poland (Papierowy Ksiezyc). In the 24th episode of The Functional Nerds, Patrick Hester and John Anealio are joined by Eisner-award nominated author Matthew Sturges. "This week, we chat about comic books, Midwinter , Jack of Fables, Vertigo comics, DC, House of Mystery, JSA All Stars, Chris Roberson, Bill Willingham, Fables, Masked, PYR, Lou Anders, Superheroes, The Dirty Dozen in Elfland, Doctor Who, Stephen Moffat, The Office of Shadow , World Building, Cover Art, Ian Banks & science fiction." You can download the episode on iTunes or listen to it at the direct link. 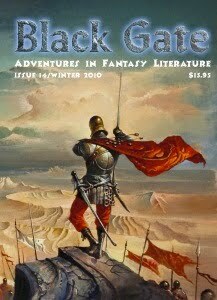 I woke up this morning to discover that Black Gate publisher and editor John O'Neill had written a post about Pyr books, picking up on my earlier post last week highlighting our sword and sorcery titles. 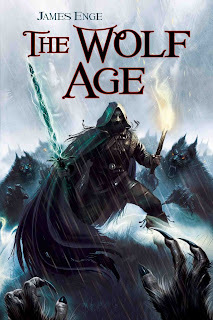 John says some very kind things about our line, and about our presentation at Dragoncon, and proclaims that ""I haven’t been this intrigued by so many books from a single publisher in a long time," calling Pyr "one of the most exciting publishers in the business." Thanks! 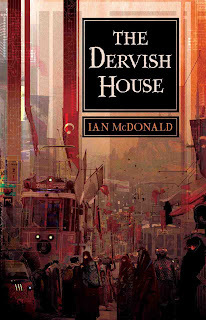 "Written with care and intelligence..."
Ian McDonald's The Dervish House is creating a splash. The New York Times calls the work "ambitious," and says that it is "an audacious look at the shift in the power centers of the world and an intense vision of one possible future." Meanwhile, The Washington Post is even more positive, saying, "Written with care and intelligence, The Dervish House whirls along at a heady pace but still manages to give a deep sense of another place that would be great to visit -- so long as you didn't have to live there"
This past weekend was Dragon*Con, that annual event where tens of thousands of attendees, many of them in costume, descend on downtown Atlanta for four days of genre mania each Labor Day weekend. Last year, I attended Dragon*Con as a guest and was blown away by what a book-friendly, age-diverse audience it was, as well as by the staggering number of authors, editors, and publishers also in attendance. 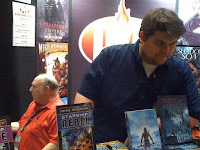 Based on that impression, I returned to Dragon*Con this year as an Exhibitor and roped in my Director of Publicity, Jill Maxick, my slush reader Rene Sears, and NINE of our authors. The Pyr booth, before opening. Thursday night itself was a rewarding meal (serving as both my lunch and dinner) at Max Lager's with Sam Sykes, Clay and Susan Griffith, John Picacio, and Jill Maxick. This was my first time meeting Sam, Clay and Susan, and I was delighted to discover they are all wonderful people (I already knew this about John and Jill). Then Friday morning, Jill and I returned to the Exhibitor Hall where she proceeded to build the artfully arranged stack of Pyr Sampler Books (we had 1046 in all) and we made final preparations for the imminent crowd. Straight up: It was a grueling con, from running a booth for four days (1pm to 7pm on Friday, 10am to 7pm on Sat and Sunday, 10am to 5pm on Monday) while also participating in programming, and still trying to get face time in with my people (six of whom I was meeting for the first time in the flesh). It was a slog to drive down late Wednesday night and then work the show until Monday night. Probably one of the hardest shows I've worked, and I did it with just three hours sleep most nights. And it was hard on my long-suffering family to be without me for so long. So, was it worth it? The convention was incredible!!! It has to be seen to be believed. The number of attendees I heard floating around was 65,000 and I could believe that or more. It comprises five hotels, with attendees staying in another five or so official overflow hotels, and quite a few other hotels in the neighborhood or thereabouts. I know they had 32,000 preregistered attendees as of last year's con, and that the registration lines for on-site registration were over THREE HOURS LONG. The only real way to describe Dragon*Con is like Spring Break in a Fantasy World or some sort of Middle Earth Mardi Gras. The hotels are jammed packed, particularly in the evening, where the lobbies of all the hotels are just unnavigable seas of bodies, many of them wearing little more than furs and duct tape. Yep yep yep...uh huh uh huh! As aforementioned, we had made special for the con a Pyr Sampler Book, as well as a limited edition lapel pin celebrating our 5th anniversary. We gave out all 1046 of the Pyr Sampler Books. In fact, they had disappeared by Saturday morning, in no small part due to the efforts of Sam Sykes, who fostered them on people in a manner which was described by James Enge as Sykes "free from any sense of mercy, compelled people to take the free stuff. In compensation, he let them buy a book every once in a while." We have also gone through all but about 250 of our 2000 Pyr 5th Anniversary Lapel Pins by Monday afternoon. We introduced the Pyr brand to thousands of people. And we sold a hell of a lot of books. Monday Morning - not even over! One of the most amazing things to me personally was how effective the Pyr Sampler Book was. Most of them disappeared on Friday, and Saturday morning, literally scores of people came up to us (that day and all the other days too actually) saying they'd read the Sampler Book and they wanted to pick up this book or that book. I was astounded. We assumed people would take these things home to peruse them at their leisure. But they read them Friday night? "Weren't you out there drinking with the 65,000 other people?" I asked one young guy, who didn't seem like the type to pass on this Toklienesque Fort Lauderdale. "Yeah, man," he replied. "I drank till 3:30am, then came back drunk and read your book until 5am. Can I get Tome of the Undergates ? Friday night at 7pm we had a Pyr Books Presents panel, complete with all nine attending authors: Mike Resnick, Jon Sprunk, Sam Sykes, Clay and Susan Griffith, James Enge, Erin Hoffman, Andrew Mayer, and Ari Marmell. Given how many there were of us, they each got 4 minutes thirty seconds to talk about their books while I flashed the cover image on a screen. Even this rigid time constraint took most of the hour, but left about 10 minutes for audience questions. We heard all weekend how great the panel was, and lots of people who came to the booth on Saturday, Sunday and Monday said they came because of this (and the two art panels I did, both of which also featured Dragon*Con special guest John Picacio). In celebration of our fifth birthday (March of this year), we had previously held a "Pyr and Dragons Adventure Contest," for which fans were invited to submit a short essay on the theme Five Reasons Why Science Fiction And Fantasy Is Important To You." 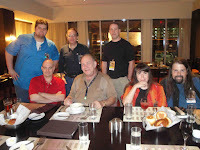 First prize was a trip for two to Dragon*Con and dinner with a group of Pyr authors (as well as myself and Jill). Lisa Iriarte won the contest - you can read her essay here. Lisa teaches seventh-grade language arts and has recently written what she hopes will become her first published novel, Assassin's Nightmare. She and her husband Joe joined myself, Jill Maxick, Mike Resnick, his wife Carol, James Enge (and daughter), Jon Sprunk, and Sam Sykes for dinner at Sear in the Marriott. Lisa and Joe were both very nice. Really sweet people, both with aspirations of writing, and Mike Resnick's unending font of amusing anecdotes about the business was spot on for the makings of a special evening. The Amazing Clay and Susan Griffith. 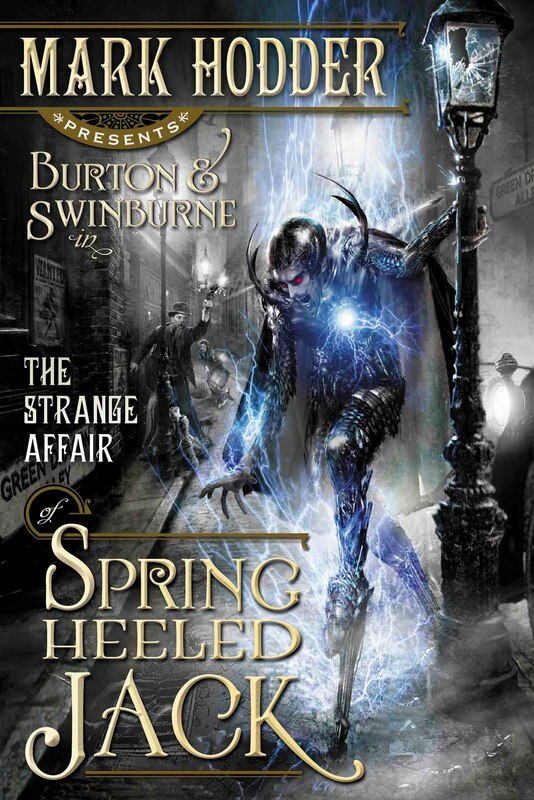 We sold out of limited number of copies of Mark Hodders' The Strange Affair of Spring Heeled Jack we had with us very early on, as well as all the copies of Jasper Kent's Twelve , and the 100 Free ARCs of The Greyfriar (Vampire Empire Book One) were a hot ticket item on Saturday. I don't think we could have had too many copies of these book on hand for this show, where steampunk and vampires are so very king. And The Society of Steam stickers that Andrew Mayer himself made in promotion of his May 2011 title also proved to be EXTREMELY popular. Saturday night, a group of us, which included Tor art director Irene Gallo, stayed up entirely entirely too late. Too late is defined as 2:15am when one has to get up three hours later at 5:15am for the Live Hugo Awards Breakfast. Organized by Stu Segal, the breakfast featured "LOU ANDERS (4 time Hugo Nominated editor), KATE BAKER (podcast director for the twice nominated Clarkesworld), EUGIE FOSTER (Nebula Award Winner), MARY ROBINETTE KOWAL (Campbell Award winner), FARAH MENDLESOHN (Hugo winner, and current nominee), JOHN PICACIO (Winner of the World Fantasy, Chesley and Int'l Horror Guild Awards and 6-time Hugo nominee) and STEPHEN H. SEGAL (Hugo winner, and current nominee)." I'm enormously touched by those few fans who braved the early morning hours to watch all but Kate Baker lose in real time! (Also touched by Robert J Sawyer, who came by later to bring me the Hugo Voting Report, so I could see that I was first in nominations, and second place in the final round!) This was followed by Stu's Stroll with the Stars, a leisurely one hour walk around the neighborhood. Sunday morning's stroll was "Pyr themed", though at least two of our authors overslept, including one who had buggered off from the bar before the rest of us despite not having to get up at 5am. At any rate, Sam, you know who the real man is. Having authors in the booth made a huge difference. 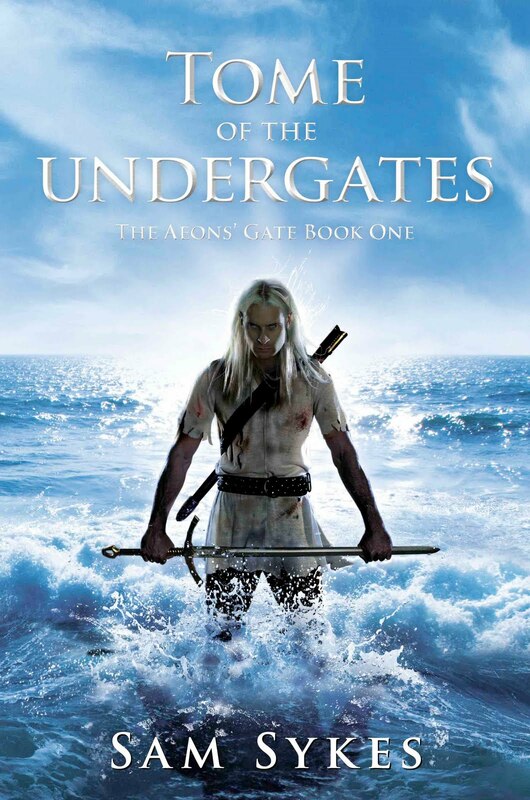 Sam Sykes had sold out all copies of Tome of the Undergates by Sunday morning. (I say "Sam had sold" not "we had sold" because Sam has a very healthy sense of competition and was determined to insure by any means necessary that he sold out first. See James Enge's aforementioned comment about Sykes and mercy.) Jon Sprunk was right behind him though, despite a much more understated presence. 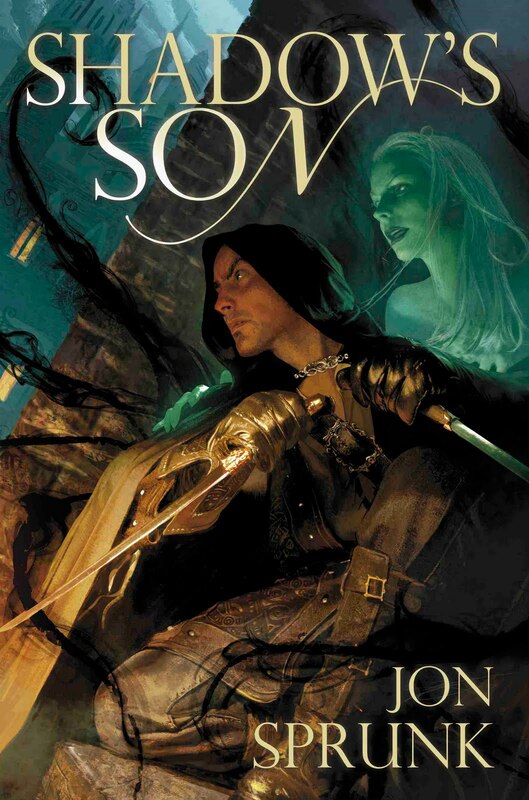 In fact, I sold a lot of Shadow's Son on Monday, after Sprunk had left, to people who told me they were buying the book because they'd talked to Jon over the weekend and "he was just such a nice guy" that they wanted to. James Enge was also a tremendously nice guy. So nice that he spent more time recommending other authors' Pyr books in favor of his own, but we still managed to sell out of his WFC award nominated Blood of Ambrose by end of day Monday. Clay and Susan Griffith were invaluable. They are former booksellers who volunteered their time and expertise. They brought us food, they worked the booth, they hand sold, and they helped with take down in the evenings. They were incredible. I'd also asked my slush reader/editorial assistant Rene Sears to help out "just for a few hours when I'm on panels." Instead, when we got there and saw what a madhouse it was, we ended up leaning on her heavily. She worked the booth for most of the con, right up until Midday Monday. I cannot stress how amazing she was. Nor how impossible the weekend would have been without her. Sunday night was another dinner at Max Lager's, where I got to sit down and spend real time with James Enge, and then it was off to the Marriott first and then the Hyatt for more beer. 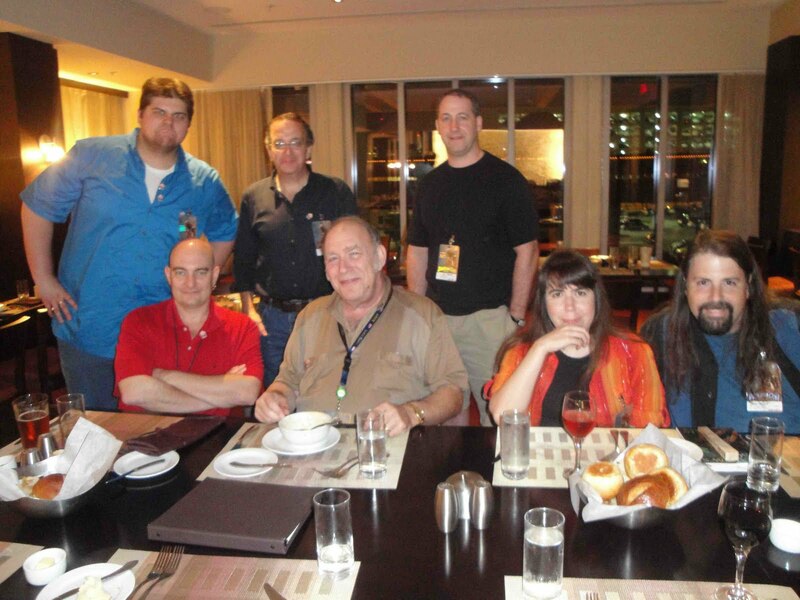 I ended the evening sitting between Mike Resnick on my right and Todd Lockwood on my left. Mike was giving agent advice to my friend David Alastair Hayden and Todd was giving artistic advice to Randall Ian Mackey, my friend and cousin's husband, who is looking to launch a career in concept illustration. It was really gratifying to just sit there and watch my friends help my friends. I was amazed to see that the crowd, although a little thinner than on the weekend, hadn't thinned out appreciably on Monday, which proved to be a really strong sales day. Jill had flown back the previous evening, so it was myself, Rene Sears, and Clay and Susan Griffith working the booth. And my good friends, the aforementioned David Alastair Hayden and his wife Cooper Chun were there as well. Cooper took our bowl of 5th Anniversary Lapel Pins and stood in the aisle a little ways away from the booth, offering people the pins, explaining to them what the pins were for, and directing them our way. She stood there all afternoon, giving a perfect sales pitch. (David calls her his Pepper Potts. And it's no insult. When the rest of us were staring at the scaffolding of the booth, wondering how to disassemble it, she stepped forward, studied it for two minutes with hands on hips, and then said, "you just press here" and then the whole thing accordioned down to the floor. Cooper makes things work.) We had five people in addition to myself helping with take down and reboxing, and what took me six and a half hours plus to do on my own took well under 2 hours with their help. And that really characterized the convention for me. With a "Little Help From My Friends" could have been the theme song. I had never met Sprunk, Sykes, the Griffiths, Marmell, or Enge before and now they are all fast friends. Clay remarked one evening when I thanked him for all the help in the booth "We felt like we were part of the Marvel Bullpen during the high Silver Age!" We learned a lot, and we could run an even better booth next year based on these learnings, but what I really learned was that we have the greatest authors and friends in the whole wide world. And that, as long as they are there with you, the Mardis Gras of Middle Earth is a great place to be. 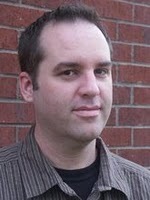 The 70th World Science Fiction Convention, to be held in 2012 in Chicago, Illinois, has just announced their guest list. We are proud as peaches to tell you that Mike Resnick will be the Author Guest of Honor! Mike is, of course, the author of numerous novels, including 11 novels for Pyr, the latest of which is the forthcoming The Buntline Special . The 70th WorldCon will be the seventh held in Chicago, and will be based at the Hyatt Regency from 30 August to 3 September 2012. Congratulations, Mike! 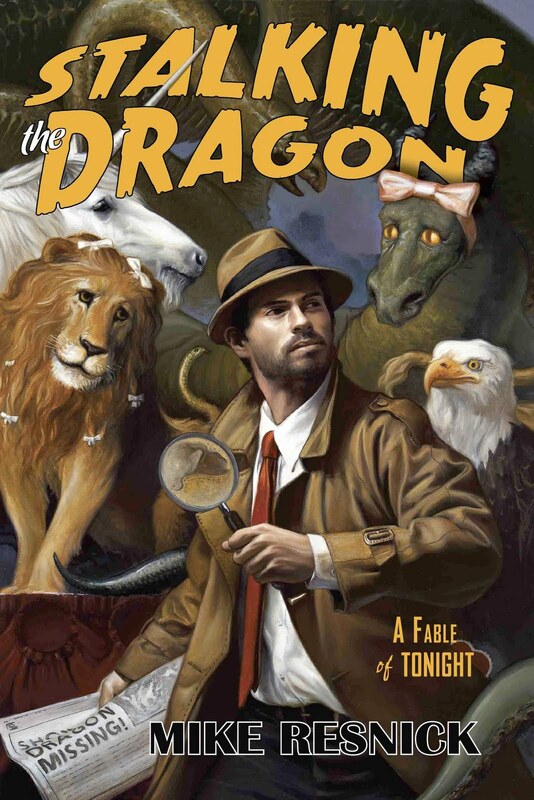 Mike Resnick has published more than 60 speculative fiction novels and 250 short stories. Resnick's novels include Santiago, The Outpost, the Widowmaker series, and the Starship series. He has edited more than forty anthologies, often supporting new authors, and served as the Executive Editor of Jim Baen's Universe and the science fiction editor for Benbella Books. He has written multiple columns dealing with the business of writing, with his dialogues with Barry Malzberg recently collected in The Business of Science Fiction, one of many non-fiction books he has published. Resnick has won five Hugo Awards and a Nebula Award as well as Japanese, French, Spanish, Polish, and Croatian science fiction awards. Booklist just gave the debut novel a starred review, saying, "The usual superlatives for really clever fantasy (imaginative, mind-bending, phantasmagorical) aren't nearly big enough for this debut novel. With this one book, Hodder has put himself on the genre map. 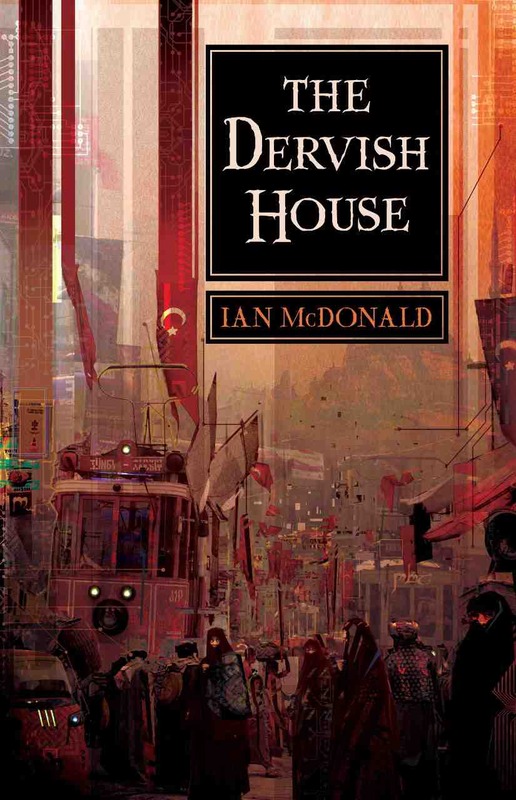 ...Hodder had brilliantly combined various genre staples--time travel, alternate reality, steampunk--into something you've never quite seen before. ....The book is incredibly ambitious, andthe author pulls it off like an old pro: not only is the setting exciting and fresh, the story is thrilling and full of surprises." 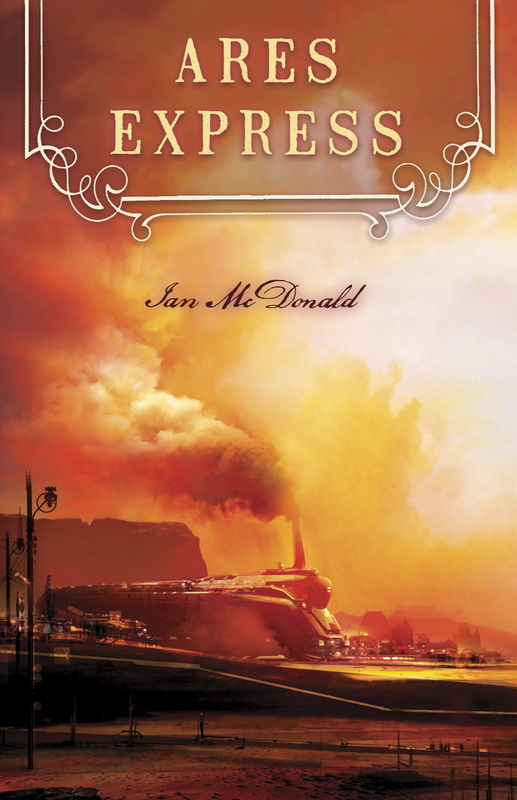 "Nothing says steampunk quite as much as a train pulled by a steam engine. And nothing says science fiction quite as much as a story set on Mars. Mix the two together, and you have Ares Express.